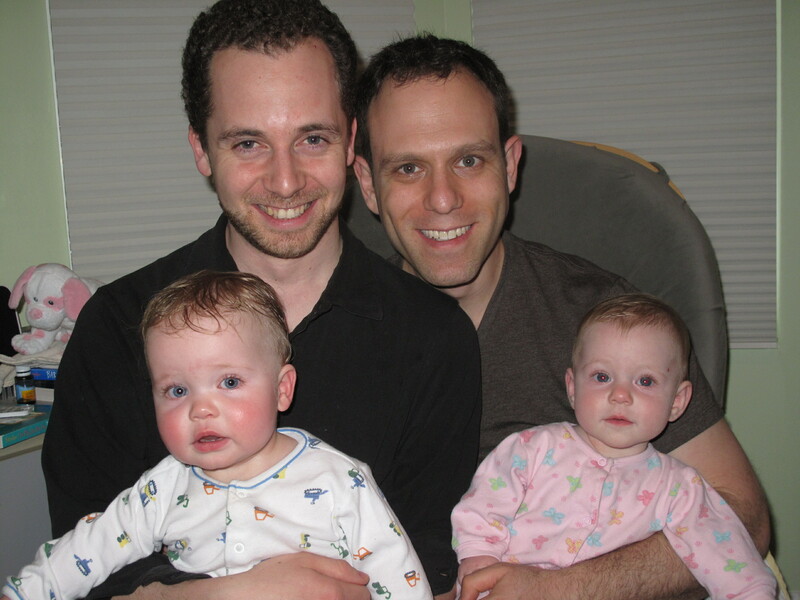 Artistic Director Mitchell Marcus chronicles his journey of raising a non-traditional family (with husband Orrin) as it relates to the non-traditional family in Falsettos (Apr 23 – May 12, 2013). Check back every week to see how he balances raising a company and raising two new born twins. Well folks, this is it. My final “Year Of The Child Blog”. The Year of The Child – Party Time! We are getting really close to the kids’ first birthday. Two more weeks to go! To crawl or not to crawl, that is the question? This week our kids turned 11 months old. I cannot believe it. Only one more month until a full year has passed since our lives changed forever. Even though they were born 5.5 weeks early, they have hit most of their milestones on time. However, it seems that many of their little friends are crawling up a storm, and they are not. They are almost crawling, and spend most of their time in crawling position, leading forward as far as they can to grab toys, but they just haven’t figured out yet how to make those legs and arms move in sync to get somewhere. This has led to a conundrum. On one hand, I want them to crawl. When I see other parents with kids who are crawling or, in some cases, walking with assistance, I think – hey, what’s going on with our kids? On the other hand, I secretly hope it never happens. First off, it means implementing the final step in converting a beautiful home from an adult residence to a child’s playpen – the baby gates. The minute they start crawling, we will have the joy of hopping over 2 foot tall gates to get up and down stairs, fiddling with latches to open our kitchen drawers, and have our beautiful cement fireplace mantel covered with pillows. But even more than the baby gates, I fear entering the crawling phase with twins. Picture this, we go to the park. I am alone with both babies. I put them down on the ground to play and they both take off, crawling in different directions. Which way do I go? Who do I chase after? The logistics of it all hurts my brain. So on one hand, I suspect (and hope) that I will soon update you with a new crawling milestone. On the other hand, a few more months of stationary play doesn’t sound so bad. On an unrelated note – now that Falsettos is done, you might be wondering what will happen to this blog. Believe it or not, it wasn’t meant to be a vanity project where I tell the world about my kids but since Falsettos (a musical about non-traditional families) coincided with my parental leave to raise my non-traditional family, the topic seemed like a good link for the seasonal programming. We’ve decided to continue the “Year Of The Child” blog until June 13 – the first birthday of my kids. Once that happens, my blog with continue, but it will go back to being about issues, trends and events in my day to day life as an Artistic Director, rather than as a Dad. So enjoy 4 more baby columns! You are currently browsing the archives for the The Year of the Child category.